Musclexp Hair, Skin & Nails Advanced multivitamin tablet contains vitamins, minerals, amino acids and health blends. it is rich in biotin. 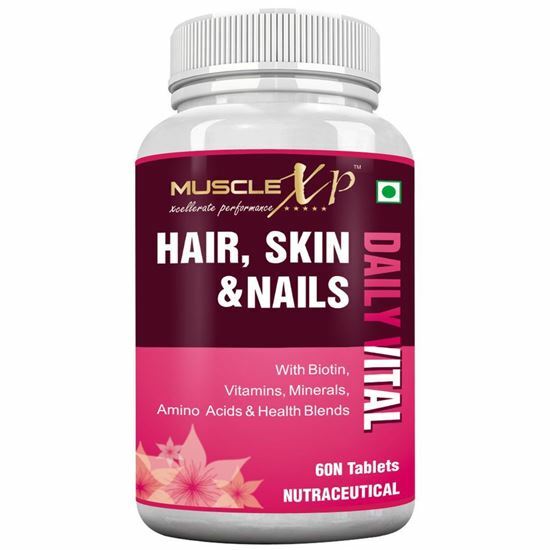 MuscleXP Hair Skin and Nails Multivitamin with biotin is a complete daily multivitamin to maintain healthy hair, skin and nails and for general health. One serving offers vitamins, minerals, amino acids, biotin, antioxidants, and other essential nutrients. Provides rich amount of vitamins, minerals, antioxidants and other nutrients along with healthy hair, skin and nails support. It contains 10,000 mcg Biotin for healthy hair care. It providing 100% RDA limits for maximum vitamins & mineral. Contains all the vital nutrients inin one convenient daily dose. For adults, take one tablet with lukewarm water, one time a day. Kindly Consume the product for atleast 6 Months on daily basis. Do not exceed the recommended daily dose. Food supplement should not be used as a substitute for a varied diet.